It is a loose definition [in Cohesion In English (Halliday & Hasan 1976)] as collocation is an intuitive category, that Halliday took from Firth but did not develop. It was re-conceptualised and systemically described by Martin 1992 as ideational discourse semantics, specifically the taxonomic lexical relations of repetition, synonymy, contrast, hyponymy and meronymy. Martin, J R 1992 English Text: system and structure. Amsterdam: Benjamins. As collocational thesauri were not available to provide operational definitions of such sets, analysis of items belonging to the same co-occurrence group proceeded on an intuitive basis. * For Martin's confusion of co-occurrence with lexical sets in this quote, see  below. This is misleading, because it is manifestly untrue. Halliday developed Firth's original conception theoretically by relating collocation systemically to repetition, synonymy, hyponymy and meronymy as types of lexical cohesion, and this to the three types of grammatical cohesion (conjunction, reference, substitution–&–ellipsis) as non-structural resources of the textual metafunction within the lexicogrammatics of Systemic Functional Linguistic theory. 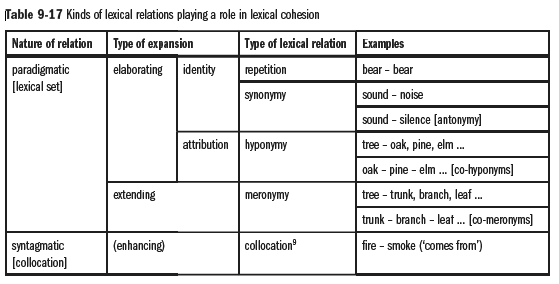 As demonstrated in great detail here, as well as being inconsistent with SFL theory in terms of both metafunction and stratification, Martin's "reconceptualisation" of Halliday's lexical cohesion as experiential discourse semantics — poorly named 'IDEATION' — is a confusion of (misunderstandings of) lexical cohesion and (misunderstandings of) 'lexis as most delicate grammar', inter alia. The system 'contrast' is Martin's invention only. In Martin (1992: 294), contrast is a system whose entry condition is the feature 'superordination' (i.e. hyponymy), despite the fact that none of its subsystems (1992: 304) — which include antonymic relations — are more delicate choices in superordination. The notion of collocation was first introduced by J.R. Firth (1957) (but note Hoey, 2005), and gained wide acceptance, particularly in work based on corpus analysis, as in the Birmingham tradition, e.g. Sinclair (1987, 1991), Coulthard (1993), Hoey (2005) and Cheng et al. (2009). For further systemic functional accounts of collocation, see e.g. Halliday (1966b), Halliday & Hasan (1976: Section 6.4), Benson & Greaves (1992), Gledhill (2000), Tucker (2007) and Matthiessen (2009b); Matthiessen (1995a) relates collocational patterns to structural configurations such as Process + Medium, Process + Range, Process + Degree; Thing + Epithet (for a corpus-based study of Process + Degree, see Matthiessen, 2009b). For a thoroughgoing detailed critique of Martin (1992), which demonstrates the extent to which the Martin constructs self-inconsistent misunderstandings of SFL theory, see Martin's Discourse Semantics, Register & Genre. For an ongoing detailed critique of Martin & Rose (2007), which identifies the extent to which the authors construct self-inconsistent misunderstandings of SFL theory, see Working With Discourse: Meaning Beyond The Clause (Martin & Rose, 2007).